Driving through the beautiful scenery we were suddenly met by the coast; huge electricity pylons planted in white sand dunes that rose from the concrete coloured mines, pebbled with elements of the harbour surrounds. Walvis Bay was a strange place that didn’t seem to quite know what it was; putting me in mind of some of the mining towns in Western Australia, mixed with Dubai. 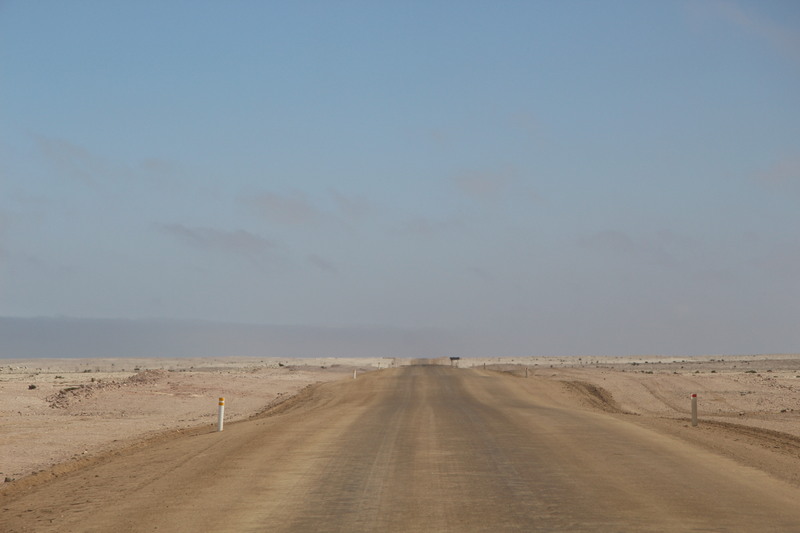 We drove on along the coast mesmerised by the schools of fishermen with rods dangled from their 4WD’s until we reached Swakopmund around 30km north. 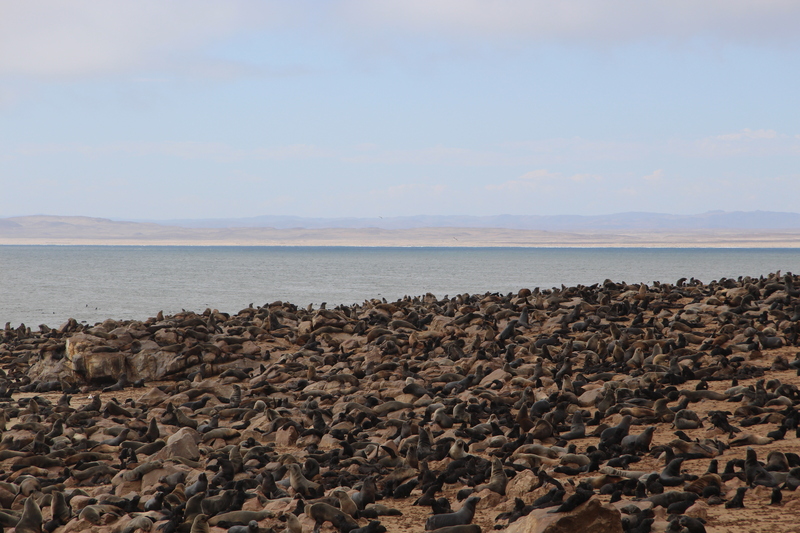 Swakopmund is an historic city showing off Germanic colonial architecture. It was a great pit stop for a few necessities, but drugged by the wilderness we headed 12km north to the Sophiadale campsite just off the main road (passing numerous checkpoints on the way). Sophiadale is a quaint camp spot with the most fantastic restaurant (apparently). Unfortunately, after building up an appetite for some German sausage we arrived on the only day the restaurant was closed! Thankfully the owner allowed us to purchase some meat and bratwurst, which we cooked over the braii that night. I wouldn’t rush back to Swakopmund. We had a short day’s driving, which was nice, but we could have pushed on to give ourselves an extra night somewhere more pleasant. 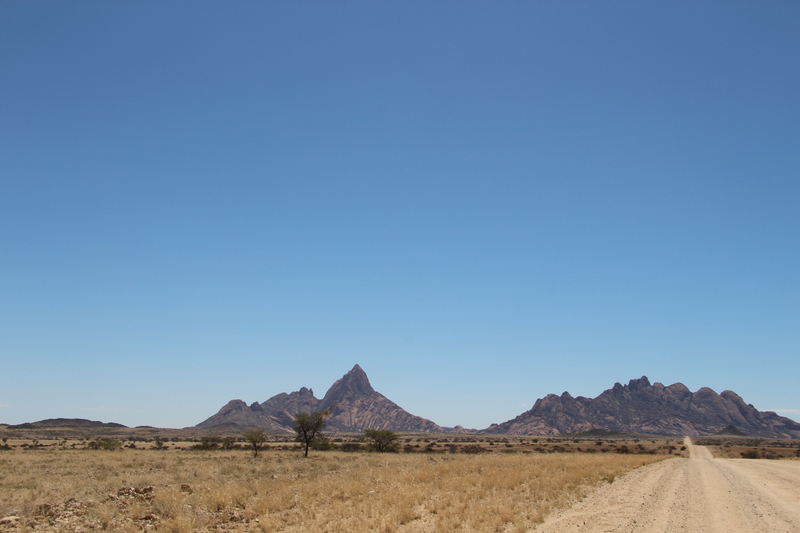 Most of the next day’s drive was on a tarmac road until we turned off onto the D1918 towards the beautiful rock formation of Spitzkoppe. 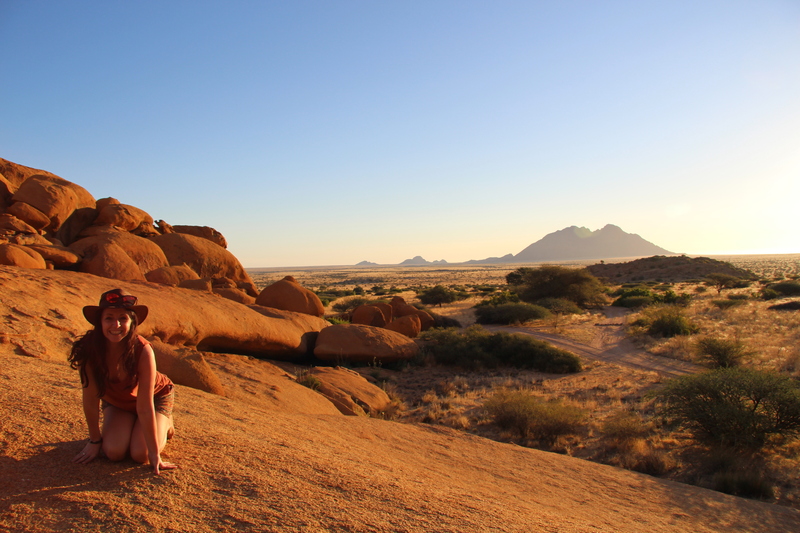 My friend Charlotte had pre-warned me how much I would enjoy Spitzkoppe and the Pondoks and I have to say it didn’t disappoint. 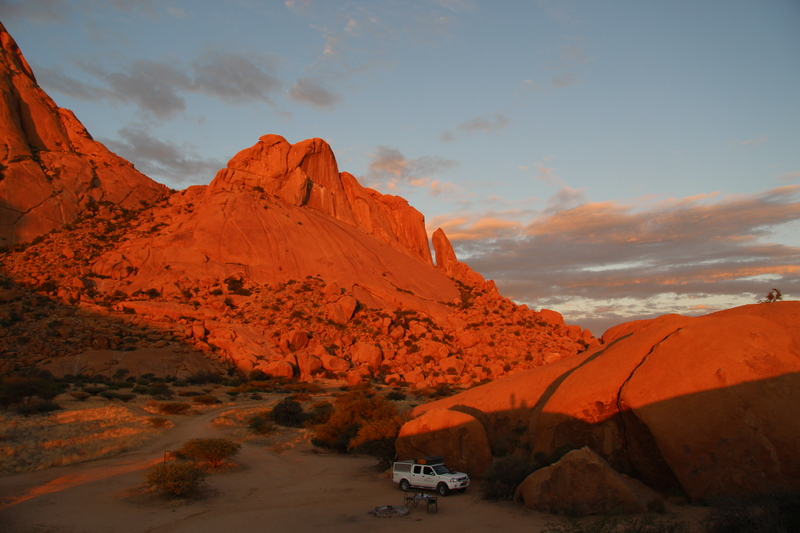 Rock boulders melded together beneath the towering Spitzkoppe make up the small national park which is dotted with camp sites. We were given a warm welcome into the park, shown a map and told to find ourselves a pitch. 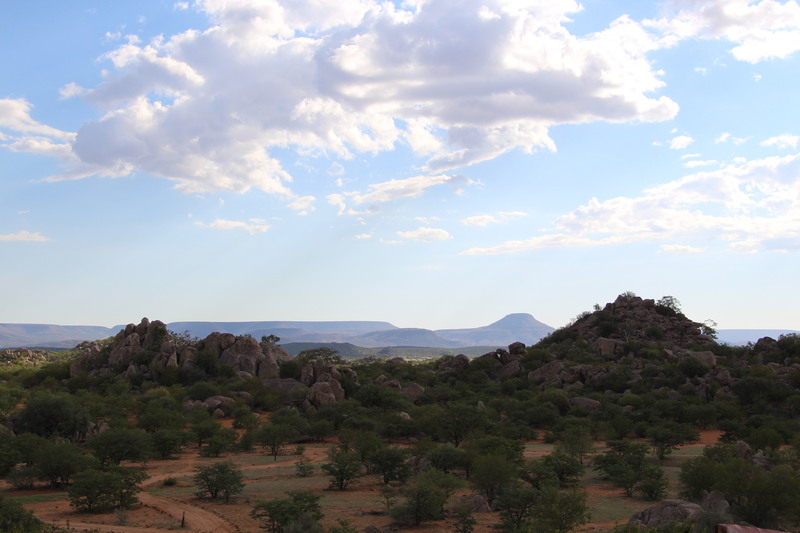 We had the luxury of arriving early enough that we had the pick of the bunch; settling for a stunning spot nestled between the dome like rocks with views onto the Brandberg. There was no one around. We were in the middle of nowhere and it was perfect. 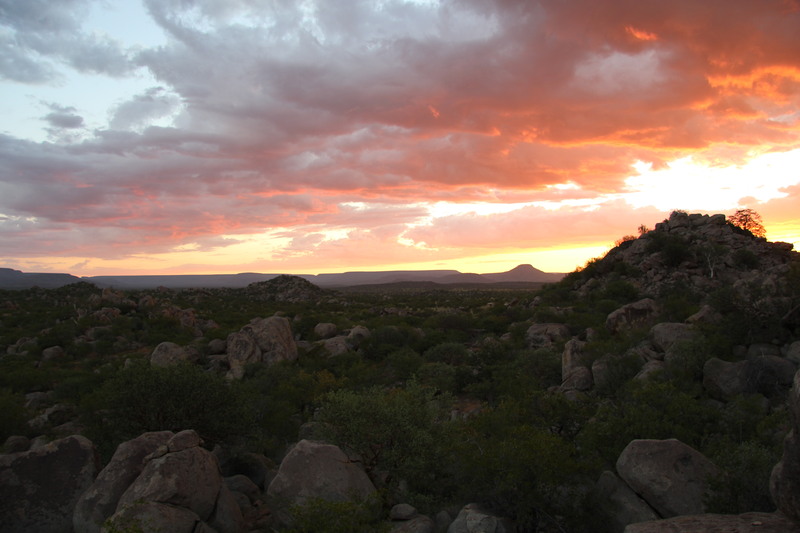 After a few hours of reading and enjoying the surrounds, we were dazzled with a stunning sunset that lit up the rocks before the light faded and we were left with a glittering cosmic display of constellations and smoky galaxies. We closed the tent zip for the night, saying goodbye to the glow of the fire. A chilly morning greeted us, which quickly turned to scorching as the hours passed by. 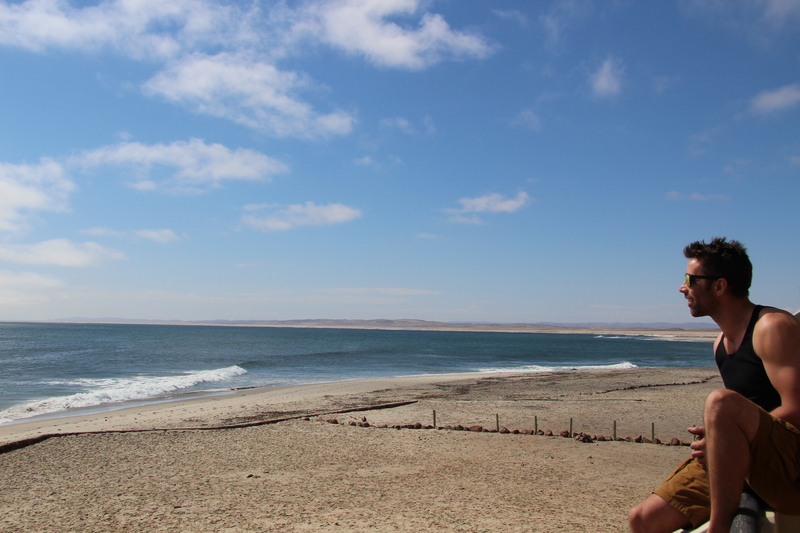 Andy headed off for a run; we packed up and headed off for the Skeleton Coast. Again we had a pretty short drive (only 4 or so hours) to Cape Cross. A brief stop in Henties Bay and we were back on the road heading further from civilisation each minute. 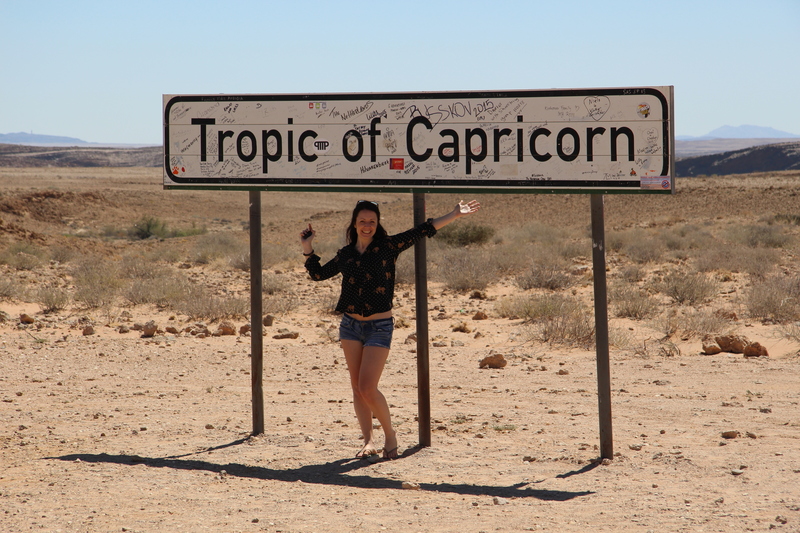 We had been booked into the Cape Cross Lodge, after being told there were no camping options any longer (which there are at the lodge) and we were pleasantly met with the most stunning room with a balcony right over the bay. The lodge had a lovely fire, which was the perfect accompaniment to a glass of wine on the sofas before dinner. Whilst it was nice being cooked for, the meal was nothing compared to the meals we had cooked over the past few nights. I would highly recommend the lodge though, for its stunning setting, friendly staff and ridiculously comfy beds. 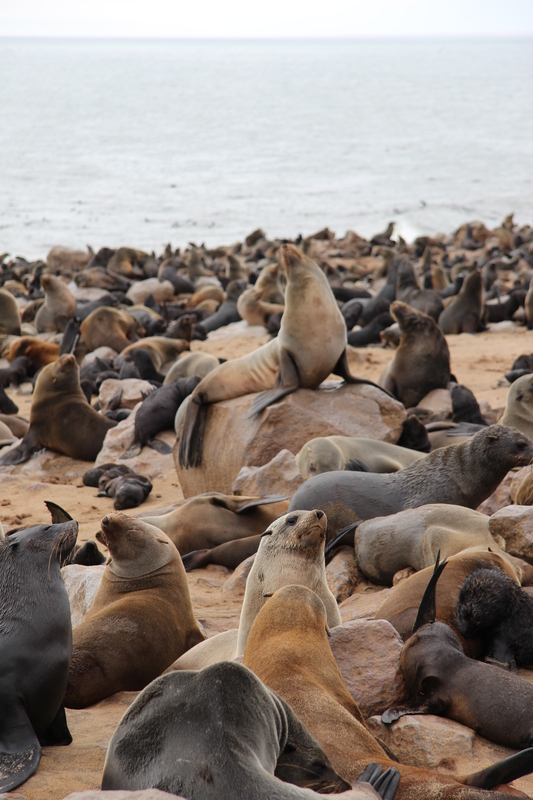 Adjacent to the lodge is the infamous cape fur seal colony – well worth a visit to see the beach blanketed with over 100,000 seals, and their excrement! We had been warned about the smell, which wasn’t at all that bad. More disturbing was the littering of dead seal pups that hadn’t survived the rip currents and were washed up on our beach every hour or so. Needless to say, our long beach walk didn’t end up being very long. 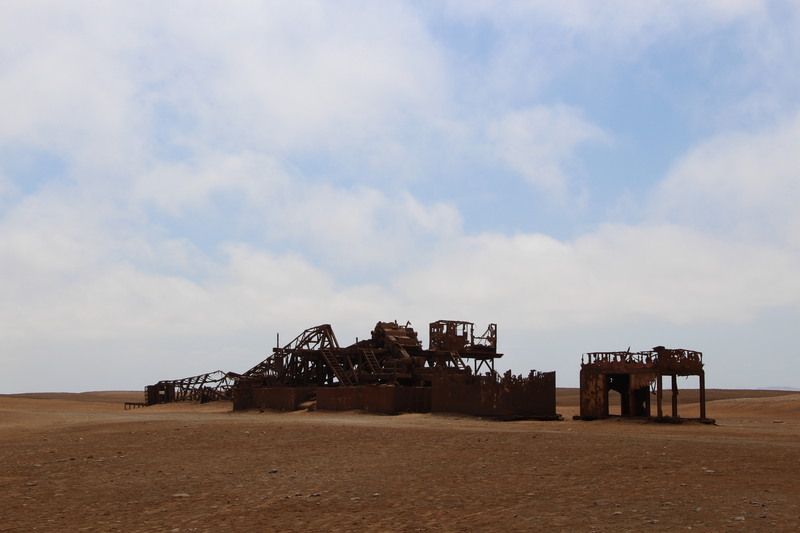 Glad for a great night sleep we headed along the Skeleton Coast to begin our drive through the national park. For the whole day we literally saw no cars. We entered the park at the Ugubmund gate which was run by one of the most laid back men I have ever come across. Nursing a tin mug of coffee he dawdled over, showed us where to enter our details, and opened the infamous skull crested gates. Hours of eerily deserted driving followed. 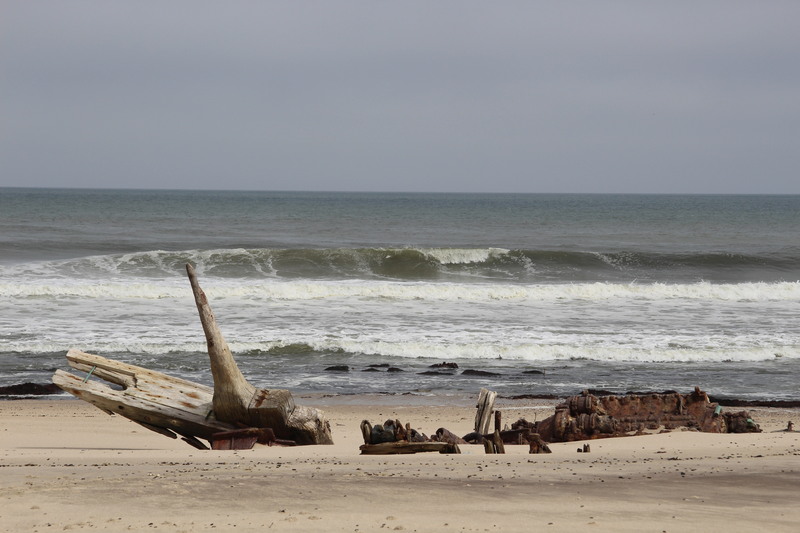 About 10km along the track there is one of the only remnants of a shipwreck on the beach, the reason the coast was given its name. 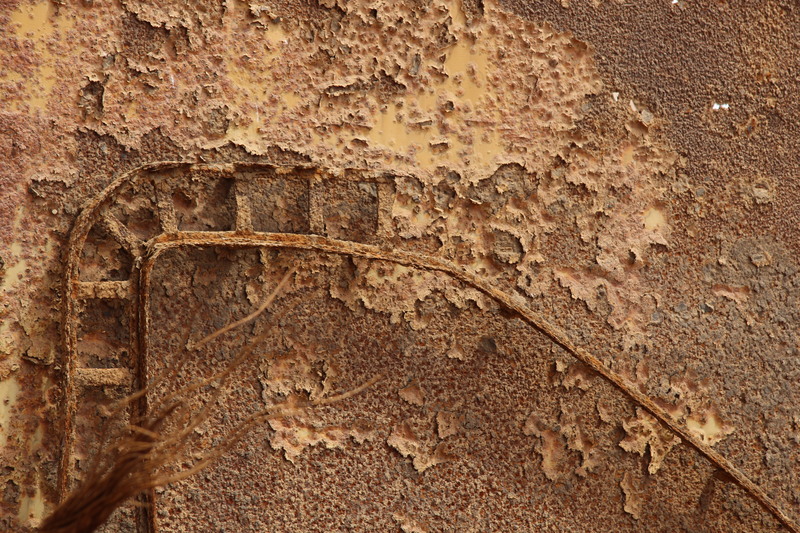 Further along an abandoned oil rig stands strong in the sand, refusing to budge, merely rusting into a delicate, tattered edged sculpture. The road went on and on and the cds, scratched from the previous few days’ endeavours, skipped along for what seemed like hours and hours. 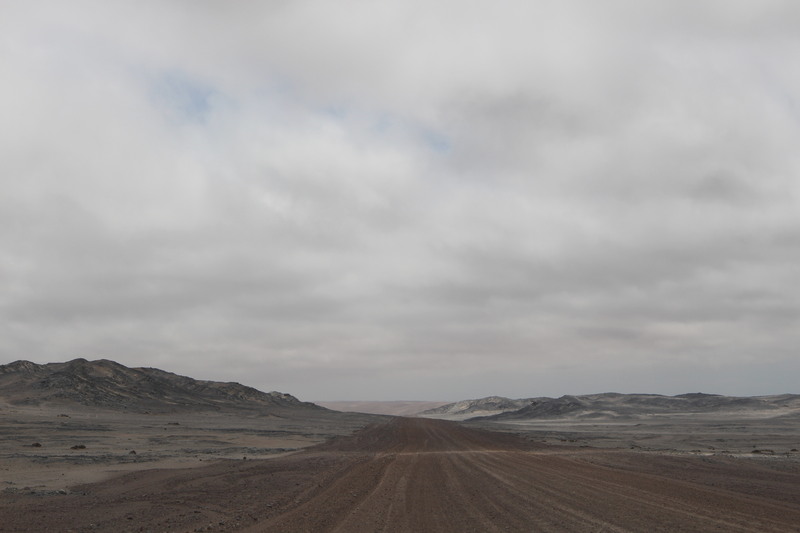 Eventually we turned off the coast and scenery changed; red mounds grew from the sand, trees spattered and the road undulated. 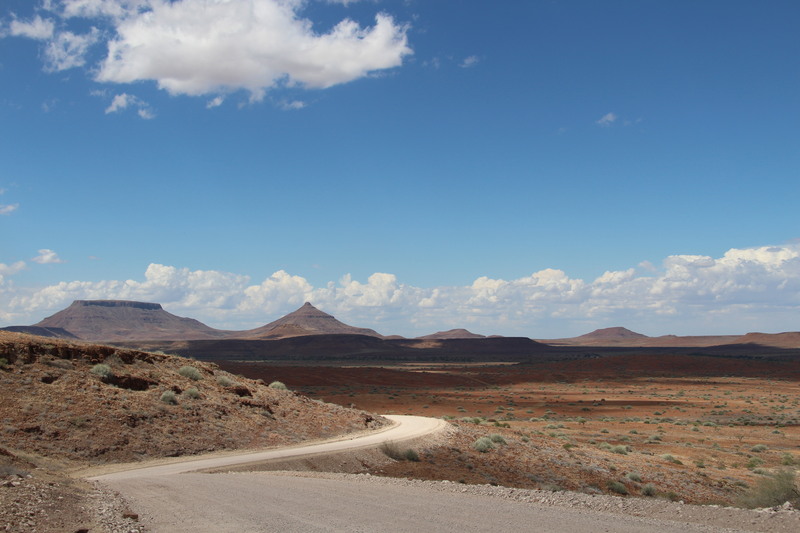 We passed through the exit gate for the park and continued on one of the most glorious drives of the whole trip towards Damaraland. 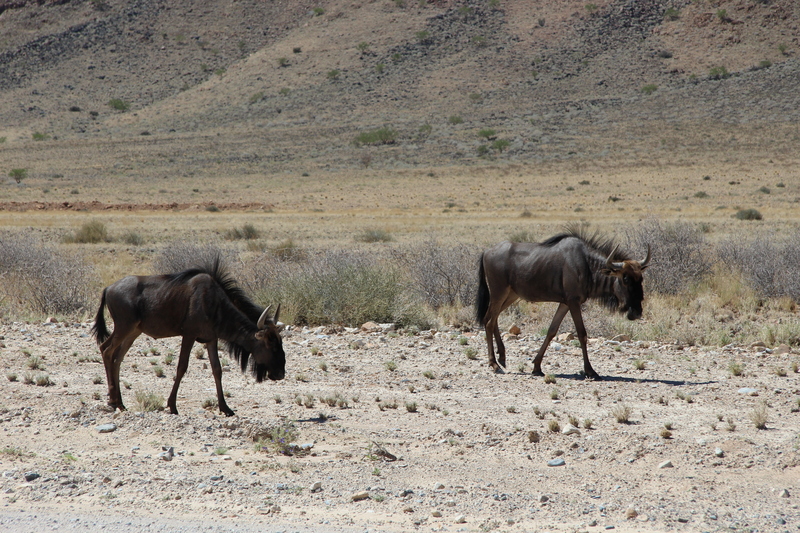 Zebra, Gembok, Wilderbeast, Ostrich and Springbok threw themselves like stones from our path along the way. 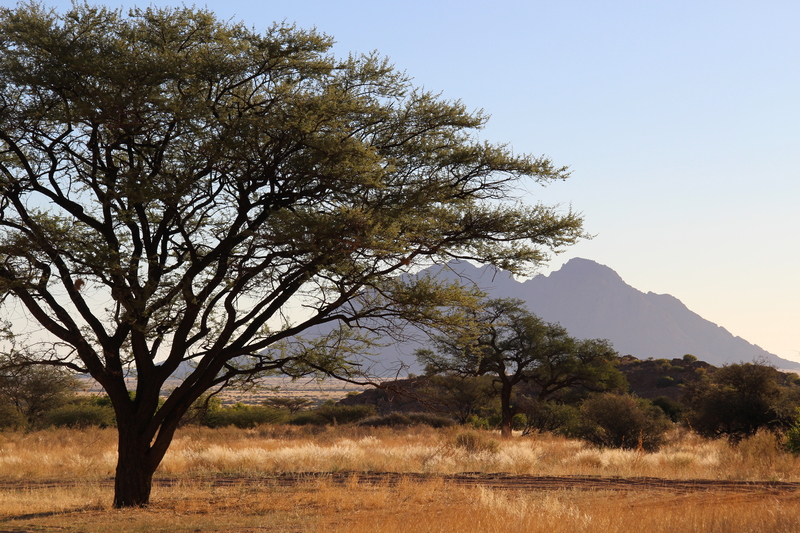 Damaraland is an indescribable paradise of lush green hills, mountains, valleys and beautiful views. Extremely tired and ready to kill each other, we drew into the Hoada Campsite. 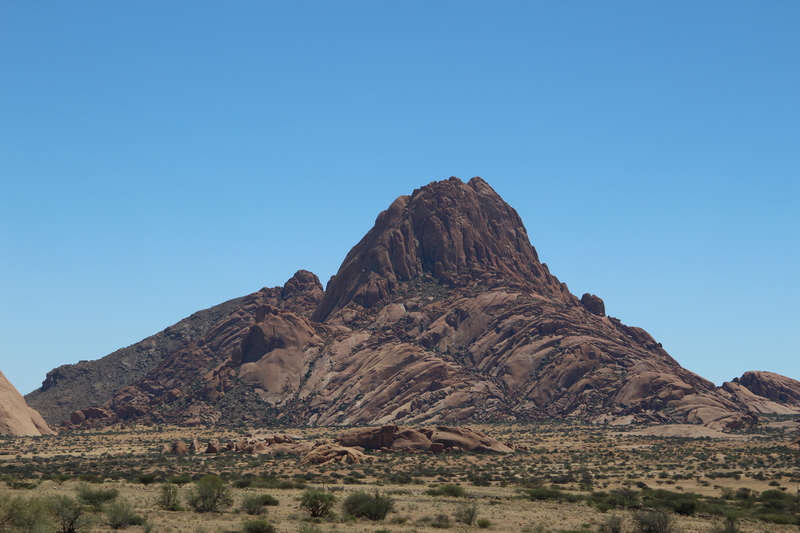 Elephantine rocks spewed up by the earth dotted the land. This has to be one of the best campsites I have ever been to in my life! 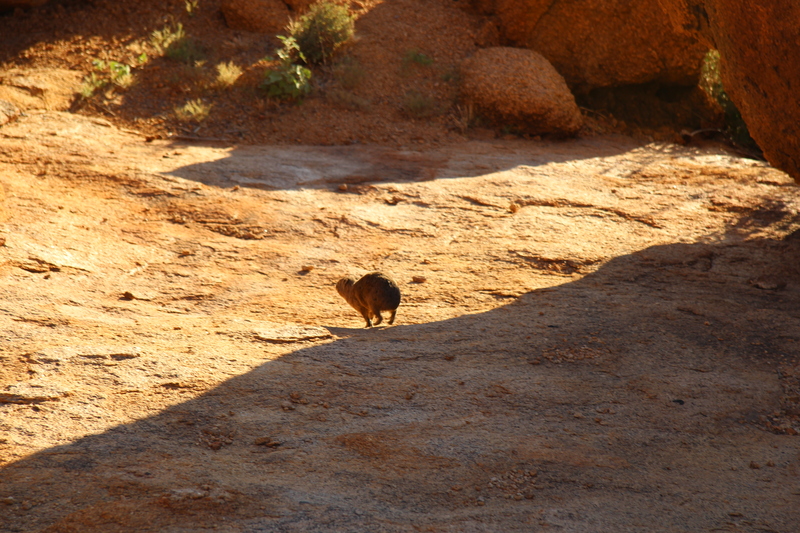 We were directed to our site, which was nestled into a grey rock. 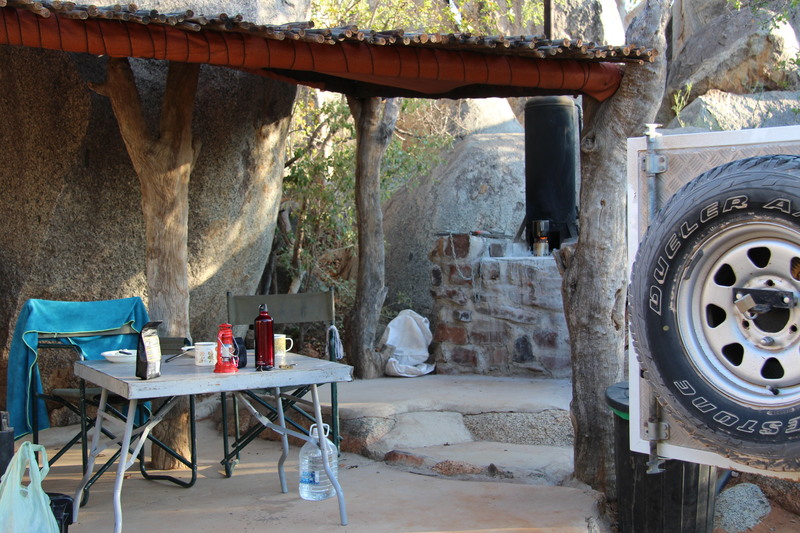 A sink and a braii pit with hot water tank made up the kitchen area, whilst around the back, between two rocks, was a flush toilet and outdoor shower. It was serious luxury compared to what we are used to and I couldn’t believe that we were paying hardly anything. 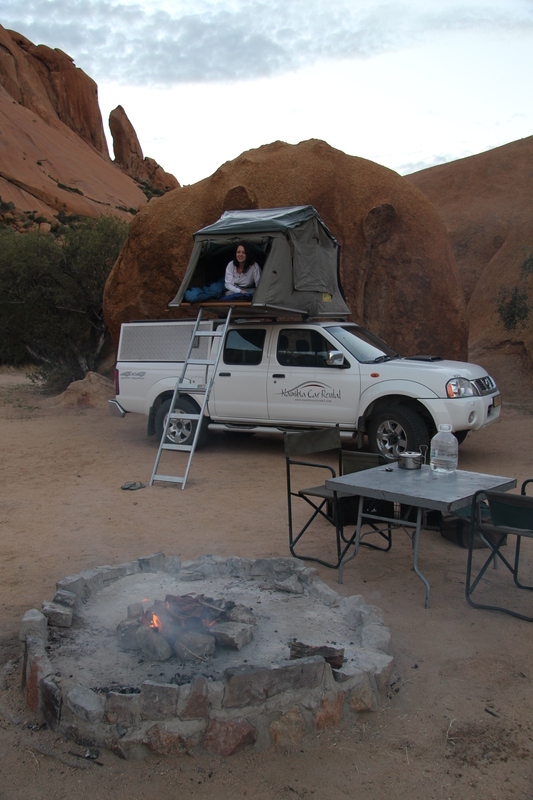 Having been on a safari camp before with a similar set up (albeit with a bed in a hut), I could not understand why anyone would pay more than 10 times the price of what we were to be anywhere else. Yet again we were pretty much away from civilisation (apart from the sound of elephants or rhinos in the night). A glorious pool and pool bar had been built by the entrance to the camp, where we had our only encounter with anyone else on site. 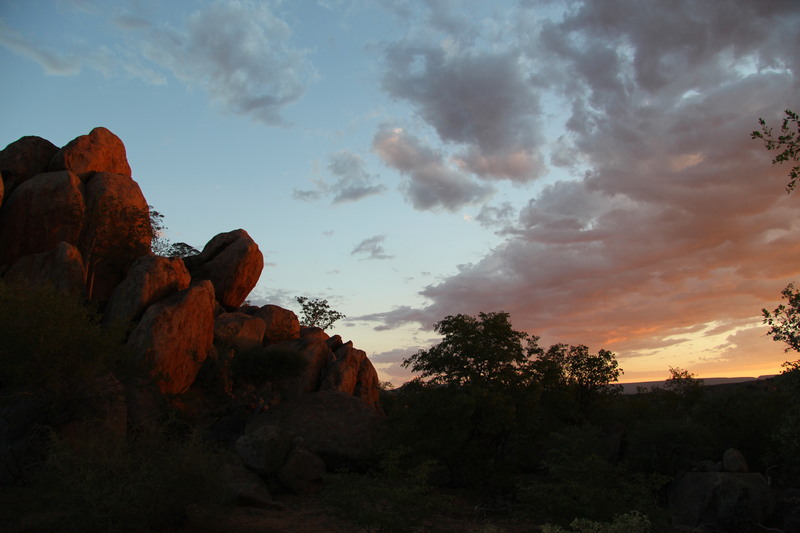 That night we witnessed the most delicious sunset, which we raced up rocks and boulders to capture…unsuccessfully! 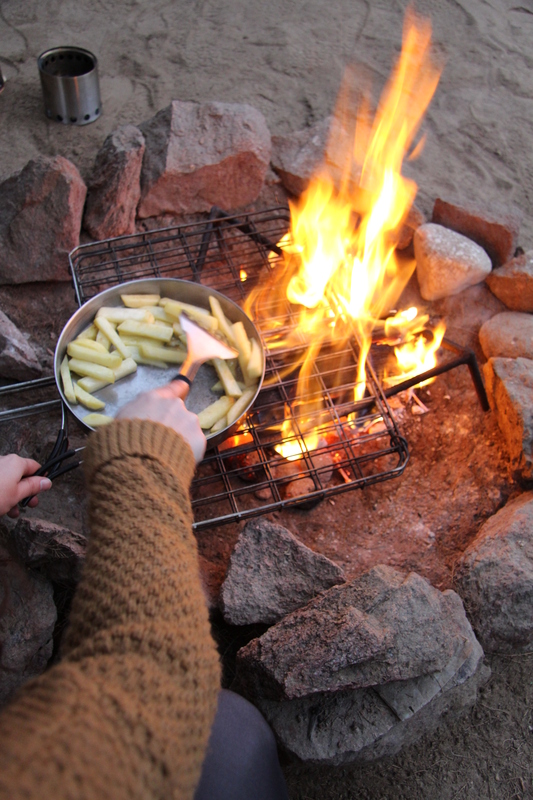 Another delicious meal from the fire and we headed to bed ready for the drive to Etosha National Park and really encounter some wildlife!